The Bose QuietComfort 20i headphones are easily some of the best sounding in-ear noise canceling headphones we’ve ever put through their paces. Then again, at $300, they ought to be. They’re fantastic if you can afford them. 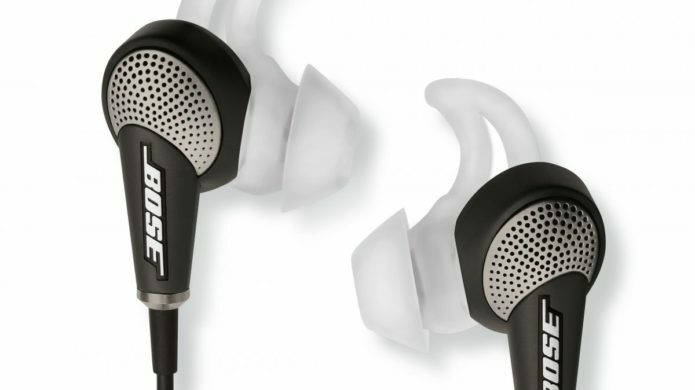 This review could be as simple as this: “If you’re willing to spend $300 on in-ear headphones, then buy the Bose QuietComfort 20 headphones.” Of course, the world of in-ear headphones is far more complicated than that. Walk into any electronics store and your choices are daunting. Sure, you can spend $20 on a pair of gaudy Skullcandy headphones, but when it comes down to it, you get what you pay for. Right? 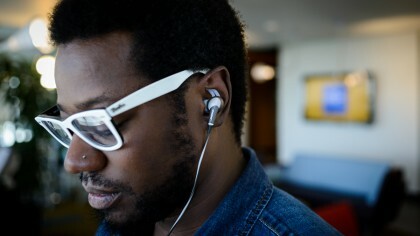 Enter the Bose QuietComfort 20i. The “i” of course denotes that the model we reviewed is iOS compatible and we tested it with an iPhone 5 as well as an iPad. We appreciated the fact that in a smartphone marketplace that is no longer dominated by Apple that Bose offers multiple versions of the QuietComfort 20: the 20i (the version we tested) boasts a three-button inline remote that works with iOS devices and lets you do everything from controlling the volume, skipping forward and backward in a playlist, pause and resume music and answering and ending calls. There’s also a button to toggle Aware Mode (more about that later) on and off. The standard one-button QuietComfort 20 works with Android, Windows and Blackberry devices. We took the Bose QuietComfort 20i on several trips across the states and we were blown away by the technological advancements that Bose has made to both noise-cancellation as well as comfort. The silicone ear tips are designed to sit comfortably in the ear while also sealing the ear canal. This is achieved not by shoving the the tip into your ear, a feature with many in-ear headphones that is just plain awful, but by using flexible ear tips that Bose calls “StayHear+” technology. 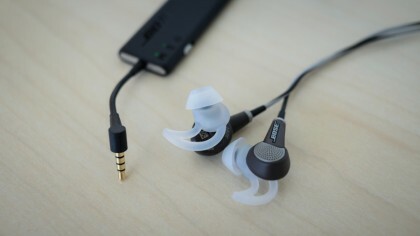 While the tips sit in your ear, StayHear+ has small wings that fit inside the cup of the outer ear. What this means is that the QuietComfort 20 manages to actually stay rather firmly in your ear while not being uncomfortable during those extended listening sessions. In fact, you can pull on the cable and the QuietComfort 20s won’t fall out. Being noise canceling in-ear headphones, the QuietComfort 20s require power and this is where the one downside (aside from the price) comes into play. 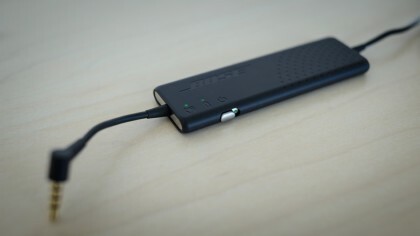 There’s a relatively large inline module that contains the rechargeable lithium ion battery and the power switch as well as the MicroUSB port (for charging) and lights for Aware Mode, Charge, and Power. 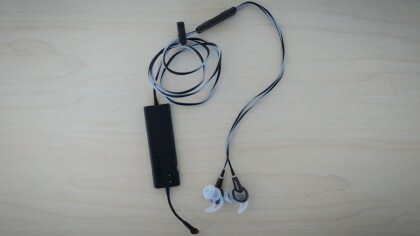 The QuietComfort 20 charges via MicroUSB and you can charge it fully in around two hours. Once fully charged Bose claims that you can expect about 16 hours from a single charge. In our tests we never ran out of battery power. That said, the QuietComfort 20s can work passively when the headphones are technically “off.” In fact, several times we were happily listening to music before realizing that the headphones weren’t even on. The QuietComfort 20 uses TriPort technology and an Active EQ to achieve what amounts to some rather amazing noise canceling. That said there’s more to these headphones than that. With the QuietComfort 20 Bose has introduced something called “Aware Mode.” Along with the volume buttons, also on the inline remote is a grey button that toggles “Aware Mode” on and off. Simply put, Aware Mode is designed to help you be able to hear important things that the noise canceling may drown out: like flight information in an airport or a car that may want to run you over. 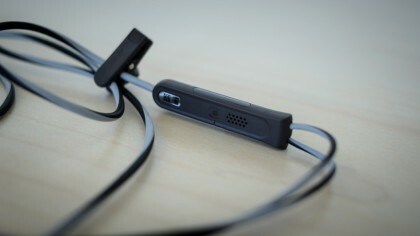 “Aware Mode” works by basically throttling down the noise cancellation. Of course, “Aware Mode” is kind of strange at first. On a cross-country flight you hit the “Aware Mode” button when the flight attendant approaches and it makes it much easier to order that all-too-important Jack and Soda. Boasting amazing noise canceling technology and incredible sound, the QuietComfort 20 is also extremely comfortable. Additionally, we really liked “Aware Mode” and laud Bose for making versions compatible with every major mobile OS. While we were pleased with most everything about the QuietComfort 20s, it’s hard to look past that $300 price tag. Also, the battery module is huge and in our tests it always felt weird. Do you let it hang out of your pocket or do you tuck it into your pocket? We’ve been using the QuietComfort 20s for weeks and we have yet to find a decent solution. The Bose QuietComfort 20s are easily some of the best sounding in-ear noise canceling headphones we’ve ever put through their paces. Of course, for $300, they better be. So ultimately we’re forced to stand by our original summation, if you have $300 to spend on in-ear noise canceling then these are probably for you.